A burglary occurs every 14.5 seconds in the U.S., and budget cuts have led to an average 911 response time of 10 minutes. Help make your home more secure by installing the Window Glass Alarm, which sounds when movement is detected, or the glass is broken or tampered with. 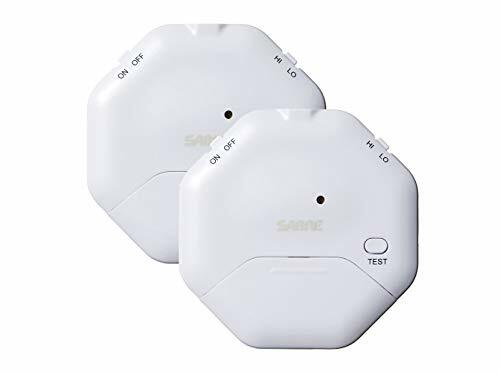 The 115 dB alarm is audible up to 300 feet (90 m) away to alert both you and the intruder that a break-in has been detected. Available as a 1-Pack (HS-GA) or 2-Pack (HS-GA2). Ideal for placement on windows and sliding glass doors, the Window Glass Alarm features a warning decal alerting burglars that the door or window is armed. With no wiring needed, the Window Glass Alarm installs in just seconds and works during power outages. The required 2xCR2032 batteries are included for a greater value. The Window Glass Alarm was developed by SABRE, the #1 pepper spray brand trusted by police and consumers worldwide, meaning this product is extremely reliable. Backed by 40 years in the security industry, SABRE products are ISO 9001:2008 certified and must pass rigorous quality assurance testing before leaving our facilities to give you peace of mind.